Now I know that paper rosettes are all the rage right now but they just arent my thing. I did get mine made, because I always like to mash up the challenge, but I cant say that I'll be doing another one anytime soon, LOL. 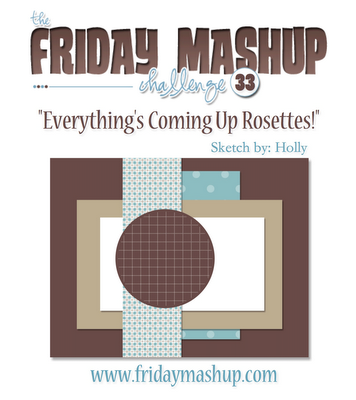 Be sure to head over to the Friday Mashup blog to check out all the great cards from the Design Team and play along with us...we want to see what YOU come up with! Glad you stuck it out and got the rosette done. This is beautiful! I really like the rich colors on this. And I think the rosette is perfect! Well, you would never know that Rosettes are "not your thing" by this beautiful example- thanks for sharing! Hi Lisa, I'll bet we uttered the same naughty words in the making of our rosettes! Glad you stuck with it as your rosette looks fabulous. Your card is a feast for the eyes! Lots of textures & patterns, and they're wonderful together! I love this.. 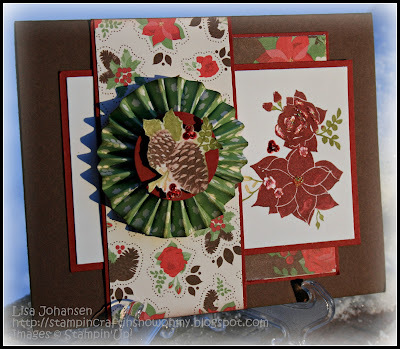 I really like those pinecones in the center and that pattern paper.. This is a great Rosette!